Livescribe made some noise earlier this year when it released the Pulse Smartpen for the PC. Its ability to record sound and synchronize the audio with written notes paved the way for the Smartpen to become the new “it” gadget. Now, just in time for the holidays, Livescribe announced the public beta of Livescribe Desktop for Mac; the Livescribe software is now compatible with all Intel-based Macs running Mac OS 10.5 (Leopard). At a recent press event, Livescribe CEO and founder Jim Marggraff demonstrated the new Pulse Smartpen features, and what the future holds for the product. Marggraff demonstrated the Smartpen’s obvious usefulness: you can record and link audio to what you are writing, and listen to what you recorded while you write. Anything you write down and record can be uploaded quickly and easily to your computer and shared. You can even search for keywords in your notes. In practical terms, students sitting in lecture can seamlessly add context to recorded lectures with written notes—why did you write down this note here, and what was missed during this part of the lecture? By simply clicking on a piece of text, the audio will jump back to the exact moment in the recording when you wrote that word. Afterward, you can share the notes with your friends who skipped class to go play Ultimate. During the demonstration, I saw some of the more unconventional features of the Smartpen. By drawing a simple X and Y axis, the pen detects a menu icon has been written. You can scroll through the pen’s menus on the page. I was impressed by the piano program, which instructs you how to write piano keys onto the page. By pushing the pen down on your hand-drawn keys, the pen will play music. You can even mix in rhythms and different sounds. While not necessarily practical, it’s a cool parlor trick and speaks to the versatility of the pen. 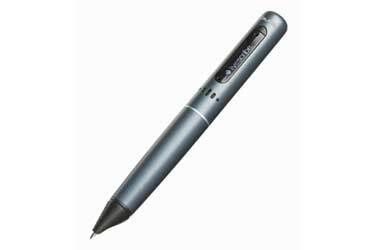 To take advantage of the text and audio features, you must use the Smartpen with Livescribe’s dot paper; the tiny dots on the paper are used by the pen as points of reference for the audio. The dot paper notepad that comes with the pen has pre-printed controls on the bottom of each page that resemble something you’d see in GarageBand. These controls allow users to fast-forward, rewind, jump, pause, speed up, or slow down the audio. The pulse pen also has a built-in language translator; Marggraff wrote several simple words in English that were translated and spoken by the pen in a variety of languages, such as Spanish and Mandarin. During my own testing with the device, I was able to replicate pretty much everything that Marggraff had demonstrated. While we don’t have many lectures to listen to here at Macworld, I personally can recall my days spent in French class in college and how useful this device would be in such a situation. While this device will likely satisfy college students and business types, it is not without its drawbacks. For Mac users, the special dot paper must be purchased from Livescribe. PC users will soon be able to print their own dot paper with the Lighscribe Desktop for Windows 1.4, slated for release later this month. PC users can also enjoy a new text translation feature called MyScript for Livescribe that will allow users to take handwritten notes and convert them to digital text. Sadly, you’ll have to wait to see these features on the Mac. But these temporary shortcomings can be overlooked in view of the larger picture. The Smartpen has a number of features and applications that are compelling to a variety of users and can be downloaded through Livescribe’s site. The $149 1GB model has storage for 100 hours of recorded audio, while the $199 2GB mode doubles the storage capacity. Both models offer plenty of space for audio recordings and applications. The public beta of Livescribe’s software for Mac will be available on November 24.